SeaFrance was a ferry company based in France, it was a wholly owned subsidiary of the French railways, SNCF. It operated ferry services between Calais, France, and Dover, England. SeaFrance began operations between Dover and Calais in 1996 after the termination of a pooling agreement with Stena Line in 1995. During it’s time the company witnessed the introduction of new tonnage in the form of the Seafrance Rodin, Seafrance Berlioz and Seafrance Moliere. On 15 November 2011, the company suspended operations for 48 hours pending a court hearing the following day. At the hearing on 16 November, the commercial court ordered the liquidation of SeaFrance, but allowed the ferry operator to continue trading until 28 January 2012. However, actual ferry operations were shut down, with the administrators claiming that the safety of vessels, staff and property could not be guaranteed. On 9 January 2012 the Commercial Court in Paris announced their decision to liquidate SeaFrance. From then on the company was prohibited from trading, with the loss of 1,850 jobs. The assets of Seafrance were later sold to Eurotunnel who in turn chartered the vessels to MyFerryLink. 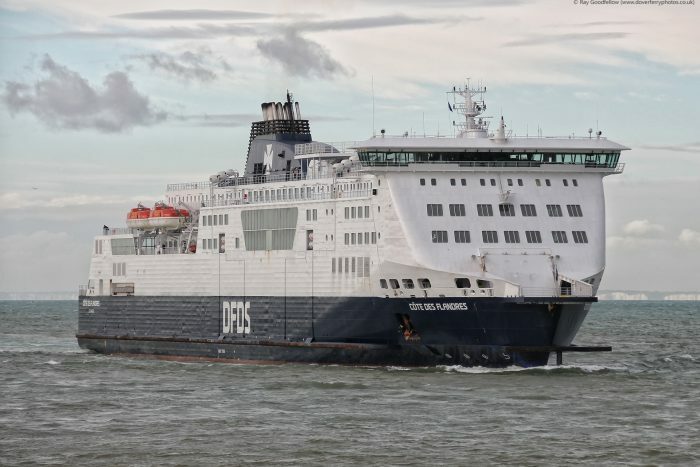 MV Côte Des Dunes, ex Rodin – Steel twin screw motor vessel, built by Aker Finnyards in Rauma, Finland (Yard No.437) for Seafrance SA in 2001 as a passenger and roll-on roll-off car and commercial vehicle ferry. MV Côte Des Flandres, ex Berlioz – Steel twin screw motor vessel, built by Chantiers Atlantique, France in 2004 (Yard No.032) for Seafrance SA as a passenger and roll-on roll-off car and commercial vehicle ferry. MV Al Andalus Express, ex Nord Pas-de-Calais, Seafrance Nord Pas-de-Calais, Nord Pas-de-Calais – Steel twin screw motor vessel, built by Chantiers du Nord et de la Méditerranée SA, Dunkirk, (Yard No 325) for Societe Nationale des Chemin de Fer Francais (SNCF), Paris in 1987 as a multi-purpose passenger and roll-on roll-off ferry for lorries and railway vehicles. MV Poeta López Anglada – ex Daniya, Stena Navigator, Seafrance Manet, Stena Parisien, Champs Elysees – Steel twin screw motor vessel, built in 1984 by Chantiers Dubigeon S.A., Prairie-au-Duc, Nantes, France (Yard No. 167) for Societe des Nationale des Chemins de Frances as a roll-on roll-off car and commercial vehicle ferry. Engined by Chantiers de l’Atlantique, St. Nazaire.